Wireless Excellence develops and manufactures the CableFree range of high performance, carrier-class Millimeter Wave radios. Today’s range of MMW products offers up to 10Gbps and 40Gbps throughput in 70-80GHz E-band spectrum and 2.5Gbps in 60GHz V-band. MMW is a high speed point-to-point Wireless transmission technology complimentary to FSO and Licensed Microwave, offering high speeds in city areas where traditional licensed microwave frequencies are often congested, and at distances exceeding those available with FSO. Typical applications for MMW include 4G/LTE backhaul, ISP backbone links as well as corporate/Enterprise and Government campus, Public Safety/Police/Safe City and urban networks. For Cellular 3G/4G/LTE operators, “Front Haul” links using CPRI are offered which allows remote positioning of the base station antennas, enhancing coverage and increasing flexibility of network deployment. High Performance Millimeter Wave Gigabit radio offering up to 10Gbps Full Duplex operating in 70/80GHz E-band. Link Aggregation capability up to 20Gbps and 40Gbps is offered. 10Gbps MMW radios are ideal for 4G/LTE Backhaul, Metro Networks, Corporate Networks, Wireless ISP, and Fibre Resilience and Disaster Recovery. High Performance Millimeter Wave Gigabit radio offering up to 2.6Gbps Full Duplex operating in 70/80GHz E-band. Link Aggregation capability up to 5.2Gbps is offered. 2.6Gbps MMW radios are ideal for 4G/LTE Backhaul, Metro Networks, Corporate Networks, Wireless ISP, and Fibre Resilience and Disaster Recovery. High Performance Millimeter Wave Gigabit radio offering up to 1.25Gbps and 2.5Gbps Full Duplex with versions for 60GHz or 70/80GHz E-band. High Performance Millimeter Wave Gigabit radio offering 4G/LTE CPRI and OBSAI Interface up to 2.5Gbps Full Duplex with versions for 60GHz or 70GHz E-band. High Performance Millimeter Wave radio offering up to 1Gbps Full Duplex in Point to Point, Point to Multipoint and Mesh networks in 60GHz V-band spectrum. High Performance Millimeter Wave Gigabit radio offering up to 1.25Gbps and 2.5Gbps Full Duplex with versions for 60GHz V-band. 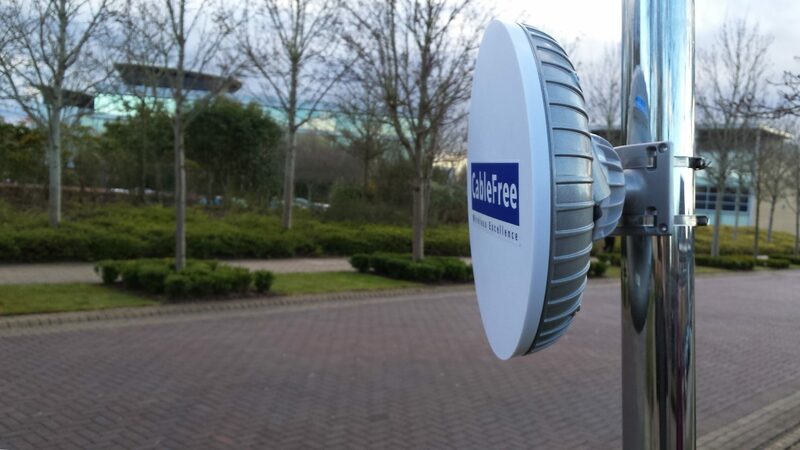 CableFree 10Gbps MMW links utilise the latest generation technology with 128/256QAM modulation to achieve genuine, uncompressed 10 GigE Full Duplex Capacity using 70GHz/80GHz E-band spectrum with ultra high Spectral Efficiency. The 10 GigE MMW links feature Automatic Coding and Modulation (ACM) which dynamically adjusts the modulation which is especially relevant for long distances, rainfall and other causes of fade. Choices of 30 and 60cm antennas cover the longest and shortest distance link requirements to ensure all customer wireless networking needs are met. 10Gbps Optical SFP+ interfaces allow direct connection to compatible 10 GigE Ethernet ports on connected customer equipment such as 10 Gig Ethernet Switches, Routers and Servers. CableFree MMW can be configured using Dual Polarised Adaptors (DPA) for Double Capacity applications and increased Resilience: with no Single Point for Failure in active transmission path, the system availability is dramatically increased. 2+0 Configurations increase 1Gbps to 2Gbps, and 10Gbps up to 20Gbps net capacity. Customers can order a MMW radio and potentially upgrade to 2+0 at a later date, to double the capacity between sites. Our team of experts offer a network link design and validation service. A full range of planning tools are available for customers who wish to plan their own networks.